• Structure ID: NBI: 024504503700001. • Location: River Mile 121.6. • River Elevation: 0 Feet (Sea Level). • Daily Traffic Count: 37,500 (2003), 40,500 (2005). • Bridge Type: Cable Stay Suspended Deck. • Length: 10,700 Feet Overall, 1,234 Foot Longest Span. • Width: 76 Feet, 4 Lanes, 2 Shoulders, 1 Divider. • Navigation Channel Width: 1,200 Foot Clear Channel. • Height Above Water: 155 Feet. • Date Built: Opened October 6, 1983. 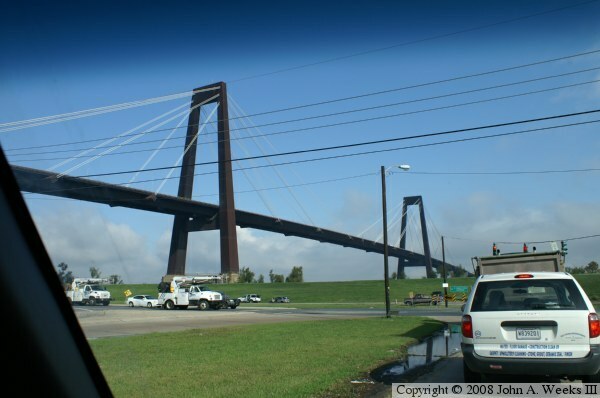 The Hale Boggs Memorial Bridge, also known as the Luling Bridge, was the first major cable stayed bridge to be built in the United States. The bridge is somewhat unusual for a cable stayed structure in that is has very few stay cables. In addition, the deck is built like a box girder, which is a much more robust structure than typically seen on suspended bridges. 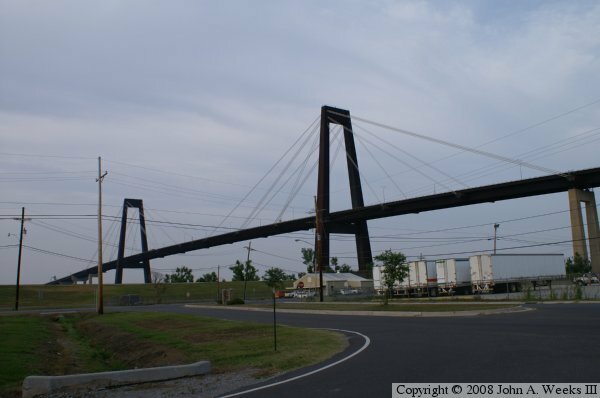 The Hale Boggs bridge is a large structure. The entire bridge has nearly two miles of elevated structure. The suspended spans include a 1,200 foot span over the river navigation channel, plus side spans of 495 feet and 508 feet. Add in two approach spans, and the large steel box girder structure is 2,744 feet long. 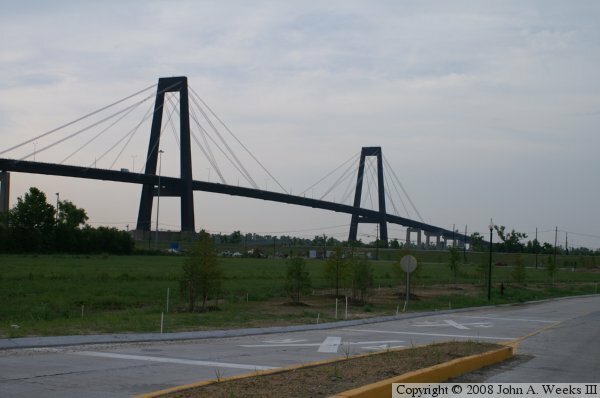 The bridge towers soar 400 feet into the air, with the deck having 155 feet of clearance between the sea-level water and the low bridge steel over the navigation channel. The bridge at Luling is supported by 72 stay cables. They are arranged in 24 groups of either 2 or 4 cables. Each tower has 12 groups of cables, 6 groups on each side of the bridge deck. The stay cables are woven from 1/4-inch diameter wire. Individual cables have between 103 and 307 strands of wire. The cables were then coated with a protective polyethylene layer that ranges between 1/4-inch and 1-inch thick. This structure is not without its problems. Early on, it was noticed that the steel in the towers was rusting much faster than expected. This turned out to be a combination of a very humid environment coupled with poor airflow inside of the towers. Later, it was discovered that the protective coating on the stay cables was failing, which allowed water to seep into the cable bundles. This caused the cables to corrode in a location that could not be fixed. 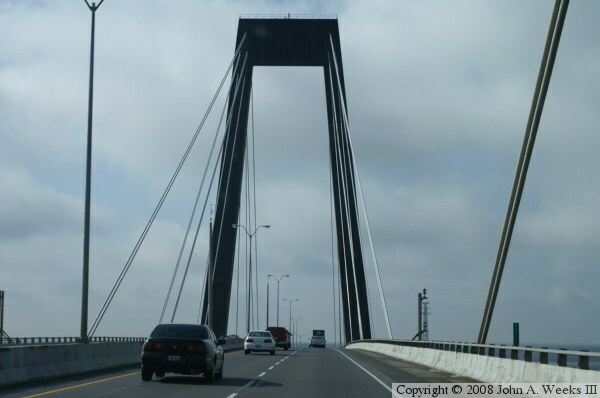 As a result, an estimated $20-million to $30-million will be invested in the bridge in 2009 to replace the stay cables, the first time such a project has been attempted in the US. Hale Boggs was elected to the US House of Representatives from Louisiana in 1940. He was instrumental in passing legislation that created the interstate highway system. While serving as the Majority Leader in 1972, the airplane carrying Boggs and Congressman Nick Begich disappeared over Alaska. The aircraft was never located. Boggs was declared dead in 1973. 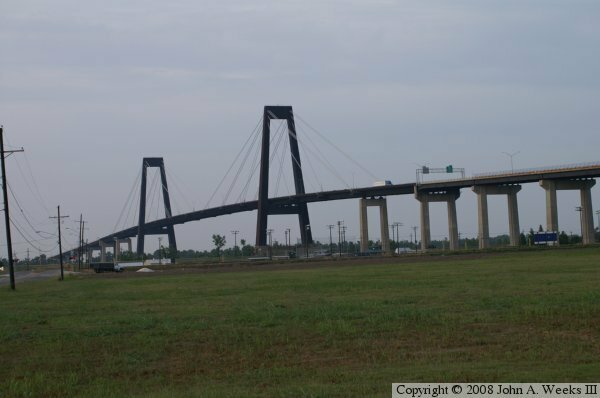 The bridge at Luling was designed and built to survive hurricane force wind, which was demonstrated when Katrina hit in 2005. My first visit to New Orleans was shortly after Katrina. My attempts to photograph the bridge did not turn out because it was raining so very hard. It was also raining the second time that I visited the bridge, but the rain let up just enough right about sunset for me to take a few photos. It was actually darker than some of these photos might suggest, which is a tribute to the amazing light gathering capabilities of a digital SLR camera. Finally, on my third visit to New Orleans, I was able to see some sunshine (note the final picture below). The photo above is a view looking northeast towards the Hale Boggs Memorial Bridge from Ashton Road just south of the Missouri Pacific Railroad tracks (now owned and operated by the Union Pacific). This vantage point is about one-half mile from the south bridge tower. The photo above is a view looking northwest towards the Hale Boggs Memorial Bridge from a railroad crossing on Ashton Plantation Blvd. This location is about 1,500 feet south of the riverbank, 1,000 feet east of I-310, and about 1,900 feet from the south bridge tower. The photo below is looking northeast towards the bridge from Ashton Road near the LA-18 River Road. This vantage point is 600 feet south of the river, 600 feet west of the I-310 freeway, and about 900 feet from the south bridge tower. 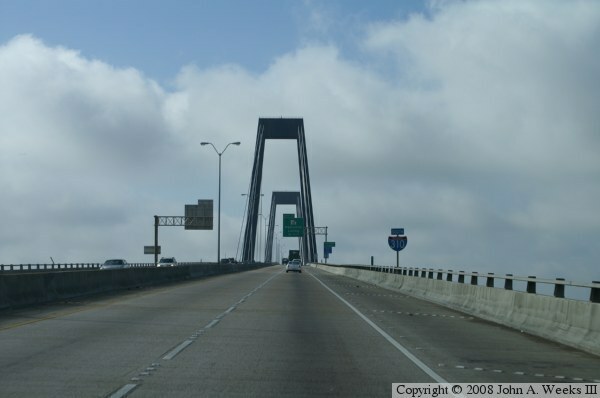 These two photos are the first two of a three photo set showing a typical bridge crossing heading southbound on I-310 towards Luling and Boutte. The first photo is the view climbing the approach spans on the north end of the structure. The photo below is approaching the cable stayed bridge deck. This photo shows that the stay cables on each side of the bridge are actually pairs of cables. 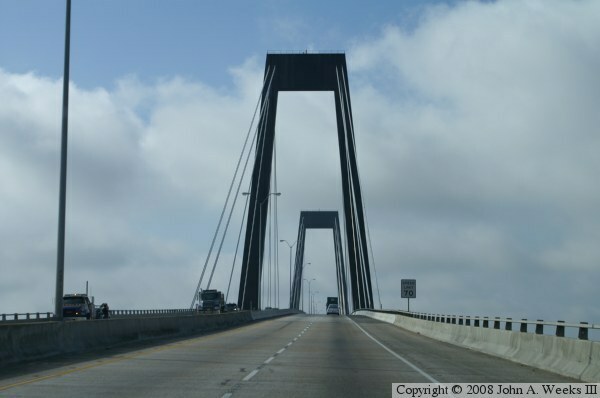 The photo above is the final photo of a three photo set showing a typical bridge crossing heading southbound on Interstate I-310. In this view, we are nearing the middle of the main bridge span. We are passing the last set of stay cables attached to the north bridge tower, and are approaching the first set of stay cables attached to the south tower. The photo below is a view looking northwest towards the main suspended bridge span from the exit ramp off of southbound I-310 as it meets the LA-18 River Road.